Am not using twitter much for what one departing Google exec calls "social" (as in "Social became state-owned, a corporate mandate called Google+" and his daughter's 2.0-savvy formulation "social is people* and the people are on Facebook"). Instead twitter is for important crap like tracking subway graffiti. The above is a recreation of a Florida tourism poster in the 49th Street N/Q/R station, which has been replaced twice in the last few weeks. 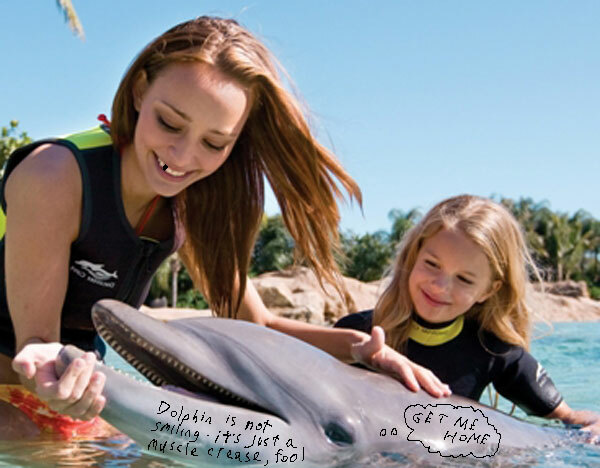 Above is how I first saw it, with the handwritten message "Dolphin is not smiling - it's just a muscle crease, fool" and the thought balloon "Get me home!" It was completely replaced, and the next time I saw it the model's tooth was re-blacked and the thought balloon said "Set me free!" (I think). A fresh poster is up now with none of this graffiti -- looking forward to my next visit to the stop. 3/14/2012 4/12/2015 by tom moody Comments Off on "Surface Variation"
Took the beats and one of the midi patterns from "No Wave No Service" and added some, sorry, jaunty melodies with clavinet, pianos, etc. Running throughout is a semi-live modular synth* improvisation that interacts with the "keyboard" parts in various ways. Am really happy with some of the contrapuntal parts where three or more tunes all come together. *Mostly WMD's GammaWaveSource module with ADSR control voltages from another module twiddling effects such as "sample kill."